[S28] James Alonzo Matthews, Jr. and Lucille Pearce, comps., Pearce, Bartlett, Matthews, Smart, and Allied Families (Austin, Tex. : Eakin Publications, Inc., 1983), p. 162. [S28] James Alonzo Matthews, Jr. and Lucille Pearce, comps., Pearce, Bartlett, Matthews, Smart, and Allied Families (Austin, Tex. : Eakin Publications, Inc., 1983), p. 162 (naming George Washington Teas as her father). [S28] James Alonzo Matthews, Jr. and Lucille Pearce, comps., Pearce, Bartlett, Matthews, Smart, and Allied Families (Austin, Tex. : Eakin Publications, Inc., 1983), p. 162 (naming George Washington Teas as his father). [S28] James Alonzo Matthews, Jr. and Lucille Pearce, comps., Pearce, Bartlett, Matthews, Smart, and Allied Families (Austin, Tex. : Eakin Publications, Inc., 1983), p. 162 (naming Philo Averill as her father). [S28] James Alonzo Matthews, Jr. et al., Pearce [etc.] and Allied Families, above, p. 162 (naming Rebecca Rice Cropsy as her mother). Marriage*: He married Rebecca Rice Cropsy. Marriage*: She married Philo Averill. [S28] James Alonzo Matthews, Jr. and Lucille Pearce, comps., Pearce, Bartlett, Matthews, Smart, and Allied Families (Austin, Tex. : Eakin Publications, Inc., 1983), p. 162 (naming Rebecca Rice Cropsy as her mother). [S28] James Alonzo Matthews, Jr. and Lucille Pearce, comps., Pearce, Bartlett, Matthews, Smart, and Allied Families (Austin, Tex. : Eakin Publications, Inc., 1983), p. 163 (naming George Washington Teas as his father). [S28] James Alonzo Matthews, Jr. et al., Pearce [etc.] and Allied Families, above, p. 163. [S28] James Alonzo Matthews, Jr. et al., Pearce [etc.] and Allied Families, above, p. 163 (stating that he died in May 1851 and attributing information to "a family Bible"). [S28] James Alonzo Matthews, Jr. and Lucille Pearce, comps., Pearce, Bartlett, Matthews, Smart, and Allied Families (Austin, Tex. : Eakin Publications, Inc., 1983), p. 171 (naming John Beale Hunt as her father). [S28] James Alonzo Matthews, Jr. et al., Pearce [etc.] and Allied Families, above, p. 171 (giving only the year and place). [S28] James Alonzo Matthews, Jr. and Lucille Pearce, comps., Pearce, Bartlett, Matthews, Smart, and Allied Families (Austin, Tex. : Eakin Publications, Inc., 1983), p. 171 (naming John Beale Hunt as his father). [S28] James Alonzo Matthews, Jr. et al., Pearce [etc.] and Allied Families, above, pp. 171 (not naming the place), 173. [S28] James Alonzo Matthews, Jr. et al., Pearce [etc.] and Allied Families, above, p. 173. [S28] James Alonzo Matthews, Jr. et al., Pearce [etc.] and Allied Families, above, pp. 171 (not naming the place), 174. [S28] James Alonzo Matthews, Jr. et al., Pearce [etc.] and Allied Families, above, p. 174. [S28] James Alonzo Matthews, Jr. et al., Pearce [etc.] and Allied Families, above, pp. 171, 175. [S28] James Alonzo Matthews, Jr. et al., Pearce [etc.] and Allied Families, above, p. 175 (naming Jesse Hunt as her father). [S28] James Alonzo Matthews, Jr. et al., Pearce [etc.] and Allied Families, above, p. 175 (naming Jesse Hunt as his father). [S28] James Alonzo Matthews, Jr. et al., Pearce [etc.] and Allied Families, above, pp. 171 (giving only the date), 175. [S28] James Alonzo Matthews, Jr. et al., Pearce [etc.] and Allied Families, above, p. 175. [S28] James Alonzo Matthews, Jr. et al., Pearce [etc.] and Allied Families, above, p. 176. [S28] James Alonzo Matthews, Jr. et al., Pearce [etc.] and Allied Families, above, p. 175 (naming Mary ['Polly'] Hunt as her mother). [S28] James Alonzo Matthews, Jr. et al., Pearce [etc.] and Allied Families, above, pp. 175-76 (naming Mary ['Polly'] Hunt as her mother). [S28] James Alonzo Matthews, Jr. et al., Pearce [etc.] and Allied Families, above, pp. 175-76 (naming Mary ['Polly'] Hunt as his mother). [S28] James Alonzo Matthews, Jr. et al., Pearce [etc.] and Allied Families, above, p. 178 (naming Mary ['Polly'] Hunt as his mother). [S28] James Alonzo Matthews, Jr. et al., Pearce [etc.] and Allied Families, above, pp. 171 (giving only the date), 178. [S28] James Alonzo Matthews, Jr. et al., Pearce [etc.] and Allied Families, above, p. 178. [S28] James Alonzo Matthews, Jr. et al., Pearce [etc.] and Allied Families, above, pp. 171, 179 (giving the month and year but no other information). [S961] Find A Grave, online at http://www.findagrave.com, memorial for Samuel Hunt, Sr., memorial no. 61955671, viewed on 30 Jun 2011. [S28] James Alonzo Matthews, Jr. et al., Pearce [etc.] and Allied Families, above, p. 179. [S28] James Alonzo Matthews, Jr. et al., Pearce [etc.] and Allied Families, above, p. 178 (naming Samuel Beale Hunt as her father). [S28] James Alonzo Matthews, Jr. et al., Pearce [etc.] and Allied Families, above, p. 178 (naming Samuel Beale Hunt as his father). [S727] Eldorado (Iowa) Cemetery, online http://www.iamonroe.org/cemetery/data/elderado.txt, downloaded 10 Mar 2002, (giving only the date and attributing information to "WPA records"). [S28] James Alonzo Matthews, Jr. et al., Pearce [etc.] and Allied Families, above, pp. 171 (stating that she was born in 1814 and not giving the month or day or naming the place), 179 (stating that she was born in 1814 and not giving the month or day). [S1057] Monroe County, Iowa Cemeteries: Cedar Township and Franklin Township (Des Moines, Iowa: Iowa Gen. Soc'y, 1988), p. 23 (not giving the date but stating that she was seventy-two years, six months, and seventeen days old when she died on 27 Feb 1888). [S28] James Alonzo Matthews, Jr. et al., Pearce [etc.] and Allied Families, above, p. 179 (not giving the date or place). [S726] Gloria J. Montoya, electronic mail to Roger Bartlett, 8 Mar 2002. [S727] Eldorado (Iowa) Cemetery, online http://www.iamonroe.org/cemetery/data/elderado.txt, downloaded 10 Mar 2002, (stating that Nancy A. Wilson was the wife of A. C. Wilson and not giving the date or place). [S1057] Monroe County, Iowa Cemeteries: Cedar Township and Franklin Township, above, p. 23 (stating that Nancy A. Wilson was the wife of A. C. Wilson and not giving the date or place). [S727] Eldorado (Iowa) Cemetery, online http://www.iamonroe.org/cemetery/data/elderado.txt, downloaded 10 Mar 2002. [S1057] Monroe County, Iowa Cemeteries: Cedar Township and Franklin Township, above, p. 23. [S28] James Alonzo Matthews, Jr. et al., Pearce [etc.] and Allied Families, above, p. 179 (giving her name as Belle and naming Nancy Anne Hunt as her mother). [S28] James Alonzo Matthews, Jr. et al., Pearce [etc.] and Allied Families, above, p. 179 (naming Nancy Anne Hunt as her mother). [S727] Eldorado (Iowa) Cemetery, online http://www.iamonroe.org/cemetery/data/elderado.txt, downloaded 10 Mar 2002, (stating that she was the daughter of A. C. and N. F. Wilson). [S1057] Monroe County, Iowa Cemeteries: Cedar Township and Franklin Township, above, p. 22 (stating that she was the daughter of A. C. and N. A. Wilson). [S28] James Alonzo Matthews, Jr. et al., Pearce [etc.] and Allied Families, above, p. 179 (naming Nancy Anne Hunt as his mother). [S28] James Alonzo Matthews, Jr. et al., Pearce [etc.] and Allied Families, above, pp. 171 (giving only the date), 179. [S28] James Alonzo Matthews, Jr. et al., Pearce [etc.] and Allied Families, above, p. 179 (naming William Claiborne Hunt as her father). [S28] James Alonzo Matthews, Jr. et al., Pearce [etc.] and Allied Families, above, p. 179 (naming William Claiborne Hunt as his father). [S28] James Alonzo Matthews, Jr. et al., Pearce [etc.] and Allied Families, above, pp. 171 (giving only the date), 180-81. [S28] James Alonzo Matthews, Jr. et al., Pearce [etc.] and Allied Families, above, p. 181 (naming John Bartlett Hunt as his father). [S28] James Alonzo Matthews, Jr. et al., Pearce [etc.] and Allied Families, above, p. 181 (naming John Bartlett Hunt as her father). Esther Hunt DeLashmutt's tombstone, Glenwood Cemetery, Glenwood, Iowa, courtesy of Dennis Bell. Obituary*: "Well-Known Pioneer of Mills Dead. [S28] James Alonzo Matthews, Jr. et al., Pearce [etc.] and Allied Families, above, pp. 171 (giving only the date), 181. 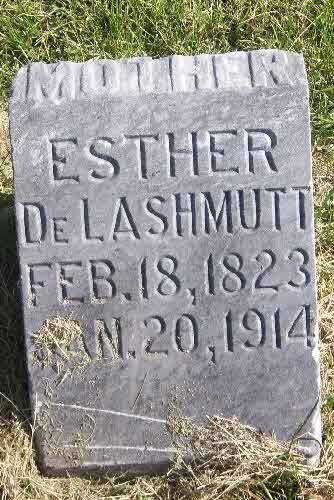 [S961] Find A Grave, online at http://www.findagrave.com, memorial for Esther DeLashmutt, memorial no. 42403892, viewed on 30 Jun 2011 (giving the date but no other information). [S961] Find A Grave, online, above, memorial for Esther DeLashmutt, memorial no. 42403892, viewed on 30 Jun 2011 (not giving the date). [S28] James Alonzo Matthews, Jr. et al., Pearce [etc.] and Allied Families, above, pp. 171, 181. [S961] Find A Grave, online, above, memorial for Esther DeLashmutt, memorial no. 42403892, viewed on 30 Jun 2011. [S1347] The Register and Leader, Des Moines, Iowa, online at http://www.newspapers.com, 24 Jan 1914, p. 3, col. 2. [S28] James Alonzo Matthews, Jr. et al., Pearce [etc.] and Allied Families, above, p. 181 (naming Esther Bartlett Hunt as her mother). [S28] James Alonzo Matthews, Jr. et al., Pearce [etc.] and Allied Families, above, p. 181 (naming Esther Bartlett Hunt as his mother). [S961] Find A Grave, online, above, memorial for Lydia A. DeLashmutt, memorial no. 42403765, viewed on 30 Jun 2011 (naming Esther DeLashmutt as her mother). [S28] James Alonzo Matthews, Jr. and Lucille Pearce, comps., Pearce, Bartlett, Matthews, Smart, and Allied Families (Austin, Tex. : Eakin Publications, Inc., 1983), p. 173 (naming Constantine Foster as her father). [S28] James Alonzo Matthews, Jr. et al., Pearce [etc.] and Allied Families, above, p. 173 (naming Margaret Sayre as her mother). [S961] Find A Grave, online at http://www.findagrave.com, memorial for Eliza Hunt, memorial no. 30690536, viewed on 30 Jun 2011. [S28] James Alonzo Matthews, Jr. and Lucille Pearce, comps., Pearce, Bartlett, Matthews, Smart, and Allied Families (Austin, Tex. : Eakin Publications, Inc., 1983), p. 173. Marriage*: He married Margaret Sayre. Marriage*: She married Constantine Foster. [S28] James Alonzo Matthews, Jr. and Lucille Pearce, comps., Pearce, Bartlett, Matthews, Smart, and Allied Families (Austin, Tex. : Eakin Publications, Inc., 1983), p. 173 (naming Margaret Sayre as her mother). [S28] James Alonzo Matthews, Jr. and Lucille Pearce, comps., Pearce, Bartlett, Matthews, Smart, and Allied Families (Austin, Tex. : Eakin Publications, Inc., 1983), p. 174. [S28] James Alonzo Matthews, Jr. et al., Pearce [etc.] and Allied Families, above, p. 175 (naming Harriet Delinda Kirkpatrick as her mother). [S28] James Alonzo Matthews, Jr. et al., Pearce [etc.] and Allied Families, above, p. 175 (naming Harriet Delinda Kirkpatrick as his mother). [S424] Fran Daniels, electronic mail to e-mail address, 31 Jul 1998, (naming Lewis (Ludwig) Zirkle as his father). [S424] Fran Daniels, electronic mail to e-mail address, 31 Jul 1998, (naming Mary Magdalene Rousch as his mother). [S431] Marvin R. Langston, electronic mail to e-mail address, 9 Jul 1998, (giving only the date and citing Reformation Lutheran Church: A Bicentennial History, 1790-1990). [S431] Marvin R. Langston, electronic mail to e-mail address, 9 Jul 1998, (citing Reformation Lutheran Church: A Bicentennial History, 1790-1990). [S424] Fran Daniels, electronic mail to e-mail address, 31 Jul 1998, (naming Daniel Zirkle as her father). [S424] Fran Daniels, electronic mail to e-mail address, 31 Jul 1998, (naming Daniel Zirkle as his father). [S424] Fran Daniels, electronic mail to e-mail address, 31 Jul 1998, (naming John Zirkle as his father). [S424] Fran Daniels, electronic mail to e-mail address, 31 Jul 1998, (naming Eleanor or Elinore Jones as his mother). [S424] Fran Daniels, electronic mail to e-mail address, 31 Jul 1998, (naming John Zirkle as her father). [S424] Fran Daniels, electronic mail to e-mail address, 31 Jul 1998, (naming Eleanor or Elinore Jones as her mother). [S424] Fran Daniels, electronic mail to e-mail address, 31 Jul 1998, (naming Abraham or Abram Peters as her father). [S424] Fran Daniels, electronic mail to e-mail address, 31 Jul 1998, (naming Catherine Zirkle as her mother). [S424] Fran Daniels, electronic mail to e-mail address, 31 Jul 1998, (naming George Rosenberger as her father). [S424] Fran Daniels, electronic mail to e-mail address, 31 Jul 1998, (naming Margaret Zirkle as her mother). [S424] Fran Daniels, electronic mail to e-mail address, 31 Jul 1998, (naming George Rosenberger as his father). [S424] Fran Daniels, electronic mail to e-mail address, 31 Jul 1998, (naming Margaret Zirkle as his mother). Marriage*: He married Margaret Neal. [S424] Fran Daniels, electronic mail to e-mail address, 31 Jul 1998, (naming Thomas Caldwell as her father). Marriage*: She married Thomas Caldwell. [S424] Fran Daniels, electronic mail to e-mail address, 31 Jul 1998, (naming Margaret Neal as her mother). [S424] Fran Daniels, electronic mail to e-mail address, 31 Jul 1998, (naming Lewis Zirkle II as her father). [S424] Fran Daniels, electronic mail to e-mail address, 31 Jul 1998, (naming Nancy Caldwell as her mother).